A new French Culture Center recently opened at L’ESPACE in the heart of Hanoi City, Vietnam. 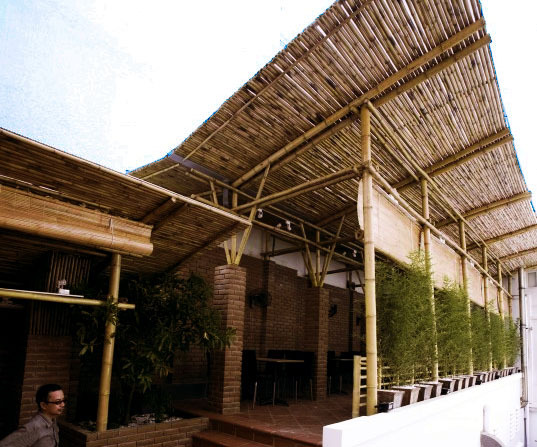 Designed by HighEnd and completed in June 2010 for the Hanoi Millennium, the modern building has been strictly built using traditional Vietnamese construction materials: earth, bamboo and silk. The new center is a low-cost construction focused on reducing environmental impact. Not only do the methods give a nod to tradition, but each material is renewable and green (even the earth brick hasn’t been fired) and the interior maximizes natural light through a transparent rooftop. A fusion of two countries brought together by history, the French Cultural Center will be a place of art and culture in Hanoi, where people can come to relax and find a little bit of France. A new French Culture Center recently opened at L'ESPACE in the heart of Hanoi City, Vietnam. Designed by HighEnd and completed in June 2010 for the Hanoi Millennium, the modern building has been strictly built using traditional Vietnamese construction materials: earth, bamboo and silk. The new center is a low-cost construction focused on reducing environmental impact. Not only do the methods give a nod to tradition, but each material is renewable and green (even the earth brick hasn't been fired) and the interior maximizes natural light through a transparent rooftop. A fusion of two countries brought together by history, the French Cultural Center will be a place of art and culture in Hanoi, where people can come to relax and find a little bit of France.